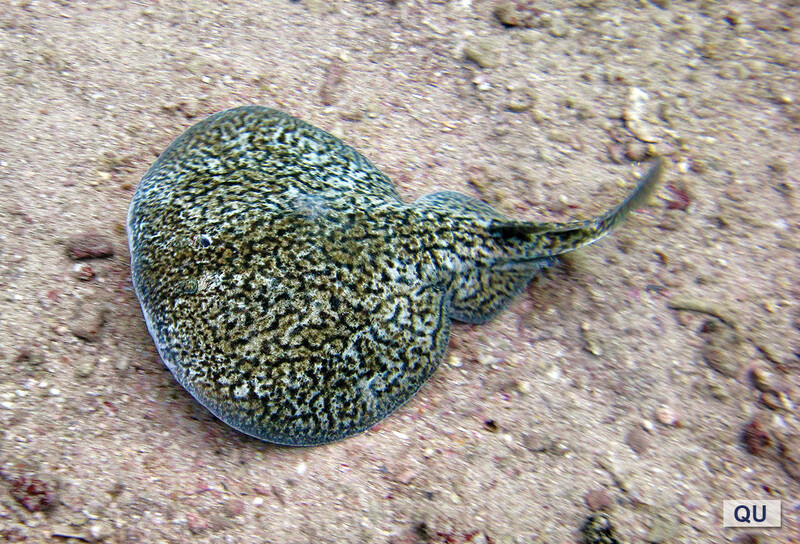 Inshore, the Marbled Electric Ray inhabits sandy bottoms and coral areas, and is often buried in sand. It also occurs offshore down to depths of 130 m. It feeds on bony fishes and can deliver a strong electric discharge, which is used to stun pray and for defense. This species occurs singly but may form groups during the breeding season. It is ovoviviparous, producing young by means of eggs which hatch inside the parent’s body. It occurs in the Western Indian Ocean from southern Africa to India and was originally described from the Arabian Gulf. The IUCN Red List currently considers the species Data Deficient (DD). It is of no interest to fisheries. The width of the disc is greater than its length. Dorsal fins are subtriangular and very close to each other; the caudal fin is slightly rounded to truncate. The color pattern is dark brown with small pale spots near the margins of the disc; dorsal surface, tail and fins are covered with vermiculate pale bands and spots.